Matt Williams c/o home address - signed my cards in blue Sharpie. This autograph request took about two weeks or so - Williams is currently a coach with the Arizona Diamondbacks and while he wasn't as good [.317 on-base percentage drags down his career a little bit] of a hitter as an active player, he was a five-time All-Star who earned four Silver Sluggers and was also a four time Gold Glove winner. Jeff D'Amico c/o home address - signed my 2001 Fleer Tradition card in blue Sharpie along with three other cards. This autograph request took about two weeks or so - I don't remember D'Amico for any particular reason except he was supposed to be a top pitching prospect for the Milwaukee Brewers in the mid 1990s, but got hurt a lot so his Major League career didn't really take off as expected. I do remember another Jeff D'Amico who pitched one season with the Kansas City Royals in 2000 - I was butchering the pronounciation of 'D'Amico' and Ricky Bottalico, who I think was signing for me before an Angels / Royals game was calling me out for not being able to say 'D'Amico' right. 2010 Topps Million Card Giveaway delivery? I only had 14 card in my Topps Million account and I'm thinking about taking delivery of the eight listed above - cards I'm leaving behind include a 1980 Topps Ken Brett, 1985 Topps Orlando Mercado, 1985 Topps Bob Forsch, 1986 Topps Gary Carter, 2002 Topps Rico Brogna and a 2005 Topps Sean Casey. Casey Kotchman c/o home address - signed my 2009 Topps Allen and Ginter card in blue ink along with two other cards. This autograph request took about two weeks or so - Kotchman's status as an Angels' top prospect in the minors seems a long time ago and even the early comparisons to 'slick hitting,' but power challenged first basemen like Keith Hernandez and Mark Grace doesn't apply to Kotchman these days. Having signed a minor league deal with the Tampa Bay Rays recently - perhaps Kotchman can revive his Major League career, though it seems like he has a lot of hurdles to overcome. Jameson Taillon c/o home address - signed two cards in blue Sharpie [the 2009 Upper Deck USA base card came back smeared] and kept the third card I sent [2010 Bowman Draft Chrome]. When it comes to through the mail requests, I try to send only one or two cards - sometimes the players who respond to my request may keep the cards I'd really like to get signed instead of the extras I may enclose to try and get an extra signed card or two. It isn't the responsibility of athletes who receive something in the mail to be autographed - sometimes however, the more cards are sent, the more likely the athletes are going to rush through signing and putting the cards back into the SASE, where they aren't too keen on letting the ink dry on the cards they just signed. Taillon was the No. 2 overall pick in 2010 for the Pittsburgh Pirates and the hard throwing righthander was ranked - No. 18 among MLB.com's Top 50 prospects for 2011. John Olerud c/o home address - signed three cards in blue ink and sent a personal testimony card unsigned in about three weeks. Olerud seems to be one of the most consistent signers TTM over the last several years - I have read about successes where he has signed two out of three and signed the personal testimony card. I prefer just getting the cards I sent all signed. Walt 'No Neck' Williams c/o home address - signed my 1976 Topps card in black ink and looks like he traced or wrote over the 'W' in Walt. This autograph request took about a week or so - I'd read about Williams in a book of cult baseball players years ago before finally sending out an autograph request to him just this year. Williams also played in Japan for a couple of years - though I didn't get a response from 'No Neck' about his time spent playing there, like my previous through the mail success with Ken Aspromonte. 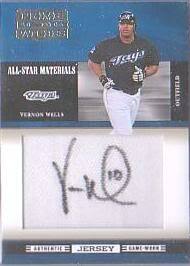 I like the Vernon Wells trade for the Angels despite the doom-and-gloom of worrying about what the team will end up having to pay Wells the next four years - he doesn't seem to be the most vocal guy, but he signs his share of autographs and seems to be a stand up guy otherwise. The Angels traded catcher Mike Napoli, who maybe the next Mickey Tettleton [he was actually was a productive player, so this is a compliment] - but the Angels milked most of Nap's talents as a one-time 17th round draft pick. Napoli wasn't going to get any better despite establishing himself as a power threat who somehow was perceived as being screwed out of playing time in favor of Jeff Mathis. The Angels also traded outfielder Juan Rivera, who kind of got a bum rap in 2010 - his stats did lag and maybe there was some 'motivation issues' with him at times, but he may enjoy a bounce back season. As an Angels' fan, I wanted the team to pick up a star locked up with a franchise in-flux instead of signing Jayson Werth, Carl Crawford or even Adrian Beltre - I maybe crazy, but I was hoping for Justin Upton or Hanley Ramirez. Wells wasn't the type of star player I was hoping the Angels would get and there are nearly $85 million reasons and four years why that is the case - I wish the Angels could have gotten more money back, but hopefully Wells can stay healthy and avert his trend of having so-so years after relatively productive seasons, including an all-star year in 2010. I suppose short of Wells turning into Albert Pujols and the Angels winning the World Series the next four years - he'll never live up to his contract. However, it seems like the experts are on Alex Andreopoulos's nuts for getting rid of the Alex Rios a year or so ago and now the Wells contract. As much as Alex Andreopoulos' sleight of hand skills are praised into duping apparent GM black eyes in Chicago and Anaheim - Andreopoulos' Blue Jays teams will still be playing for third place in American League East. It doesn't matter how many prospects, draft picks or money he hoards, Andreopoulos is still not going to get what is important in a way that consumes the people who deal with more than just statistical analysis - which is a legitimate chance to compete for a championship. Maybe it is to circumstance, but for all the pundits and numbers guys who just love the guy right now and since he was hired - a #6 from Dave Cameron maybe the best accolade the Toronto organization might get this year. The flags fly in Anaheim, not in Toronto. Ken Aspromonte c/o home address - signed my 2008 Topps Heritage foil stamped 1959 Topps buyback card in blue ink. It took about a week or so to get back this autograph request sent to him - I liked how he responded to my question about playing in Japan once upon a time long ago. I like these cards because it gives me another product to chase some base/cheap refractor parallel cards of prospects / rookies - when Bowman/Bowman Chrome/Bowman Draft lines get a little boring as far as how the cards look in general. Maybe the inclusion of USA players in this product is too much overkill - especially when Topps is angling to put amateur players in a baseball card product strictly for profit [and perhaps not as a fundraiser for USA Baseball]. Maybe 2010 draft picks / 2010 pro debut guys or even the addition of baseball's chosen one would been much better for this product - but I guess Topps has to milk its USA license to make trading cards. For better for worse, Torii Hunter is my favorite current Angels' player - I think he generally represents the Angels well and even if he isn't 100 percent, he always plays hard on the field and grinds out at-bats at the plate. As much I like the guy, I'm not so obsessed too much with collecting any of his particular cards - however I did find a lot of 15 cards online that I picked up for a dollar that included a small mix of base cards, maybe a couple of inserts and these early cards of Hunter. Cards pictured are his 1994 Score rookie card, his 1994 Pinnacle rookie card and his 1995 Upper Deck Minors card - my favorite is probably the 1995 Upper Deck Minors card since I liked the Upper Deck design that year. I picked up this card because I'm on a 'shiny, refractor parallel' kick and I'm trying to pick up related inserts here and there - also I'm trying to digging out all of my inserts and listing them all on a spreadsheet, even if they aren't worth much. I don't think I'm a collector who buys too many boxes of cards to have numerous types of inserts.- however, I'd like to know the types of cards [i.e. refractor, common insert, parallel, short print, etc]. At the very least, I figure I can take a look through a part of my collection and account for the cards I have in-hand - instead of merely just hoarding and hoarding random cards that I may not get to appreciate after they've been squirreled away in binders and/or boxes. How much this a 'very good' condition mid-career card of Hall of Fame legend worth these days - probably not much more or maybe less than the $2 I paid, but I don't think I've got a lot of cards from 30 years back to flip through and show off. It may not be the best looking card [with an airbrushed New York Yankees cap on Mr. October's head] - there was something compelling me to pick up this first New York Yankees card of the prodigious slugger, not from my youth. I think I feel a little buyer's remorse because I bought the card for a dollar but I had to pay another $2.50 for shipping / handling - late in 2010, I wasn't able to trade for a Bowman Chrome retail Green refractor and wanted some kind of refractor of the Los Angeles Dodgers' farmhand. I just had to have the Platinum retail Purple refractor when I first saw it - even though I had the base version already. From looking at Sands' minor league stats - he maybe the type of player who emerges from relative obscurity to contribute at the Major League level as a rookie star or be the next Billy Ashley FWIW. Jimmy Key c/o home address - signed one card in blue Sharpie and returned the other card I enclosed in my request unsigned. I sent my autograph request to Key late in December 2010 and got it back earlier this week - looking at his stats, he had a long Major League career, though my perception was he was strictly a finesse guy who relied more on guile instead of pure stuff coming out of his left hand. Bill Swift c/o home address - signed several cards in a 'weird' colored Sharpie and kept three for himself. Swift had a serviceable Major League career, though he wasn't the most durable pitcher - he enjoyed his best season in 1993 when he won 21 games and pitched in a career high 232 innings, teaming up win 22 game winner John Burkett to give the Giants a one-two punch at the top of their rotation. I sent my autograph request to Swift late in December 2010 and got it back earlier this week - the card I needed signed for my set was from a 2004 Upper Deck USA 25th Anniversary boxed set. I wish I could show you an actual certified autograph card of recent Hall of Fame inductee Roberto Alomar, particularly a card I picked up back in 2007 - but Upper Deck went with using cheap, synthetic ball material with their Sweet Spot products and all I'm left with in 2011 is what you see pictured. I kind of like the Bert Blyleven card I got signed in-person since it features him early on in his Major League career and towards his last three seasons - as an Angels' player. I picked up a hand-collated set [around $25 shipped] of 2010 Bowman Draft and while there are Mike Stanton, Stephen Strasburg, Jason Heyward and Buster Posey cards in the set - Topps has already rolled the presses on releasing various basic, non-autograph MLBPA rookie cards of these guys and the basic cards from the set are only worth a couple of bucks each. Maybe the most redeeming if not exactly noteworthy feature to the set - is Topps decided to include non-auto base cards of the guys who do have Bowman Draft Chrome autographs in the set, like Manny Machado of the Baltimore Orioles, Zach Lee of the Los Angeles Dodgers or Zack Cox of the St. Louis Cardinals. For an in-person or through the mail autograph collector, Topps almost gets a thumbs up - except for the foil stamped facsimile signatures [not like Peter Tago's card, which doesn't have the facsimile signature] on the cards . A signed 2010 Bowman Draft card with a foil stamped fascimile signature is probably not going to look as good autographed in-person / through the mail - particularly when the facsimile is stamped across the card. I realize Bowman Draft is a prospector's product where gripes about aesthetics aren't always valued as long as there is a good crop of signed Bowman Draft Chrome cards and corresponding parallels - however some of the Photoshop work is off in trying to show the draft picks wearing Major League uniforms, particularly the doctored 'in-action' shots of particular players in high school or college. Like other casual collectors getting into collecting baseball cards for the first time, there was a misconception anything old was going to be valuable - but really anything old [say 1973 and before] is just old unless it was almost in pack-fresh condition [no using the cards in-between bike spokes] and these days, professionally graded. Still, I picked this card up of Albie Pearson for $2 shipped because with the Angels' 50th Anniversary this upcoming year - there will be probably be an opportunity to see him in-person and get his autograph. While an old friend had gotten him through the mail years ago - I believe he refuses mail sent to him these days. The card is worn down, beaten up but has survived for at least 50 years - for rank-and-file vintage cards, there is some collecting value as a relic from decades past, even if it doesn't always picture a Hall of Famer like a Mickey Mantle, Willie Mays, Hank Aaron or Ted Williams. I don't know how I've evolved as a collector over the last 10 years, but there is just something about collecting that makes me want to go on - to buy more stuff to sort through because I like baseball cards in general. The reality is I don't always have the money to spend on any sorts of cards on a whim - however as a collector, it doesn't mean I should completely refrain from regularly feeding my hunger of cardboard with various baseball players pictured on them. To get newer cards in my collection, trading maybe the most important collecting aspect I want to engage in this year - even if I have a long ways to go before getting a competent trade list going and perhaps getting in touch with other willing traders. I just have to pick my spots and look for about 10-15 blog trades - trading for the cards I may need. My goal in 2011 for the blog is to have at have double digit posts per month on this blog - everything seems to have been blogged about and sometimes I feel I'm lagging behind other bloggers who have simply been more prominent. However, it doesn't mean I should go idle for a period of time and just spit out two, three or four random posts a month - why not go for 10, 15, 20 random posts to see if I can generate some reaction and also get some response from other collectors.